Classic rock is alive and well on these shores thanks to bands like last month’s Introducing stars Stone Broken, and a band who have recently toured with those fellow Midlanders, The Bad Flowers. The Cannock three-piece have just released their debut album Starting Gun and have a ton of festival appearances lined up over the summer, at which you can catch their hook-heavy, riff-tastic and bombastic rock style, driven from the kit by the estimable drum talents of Karl Selickis. What was your introduction to drumming? 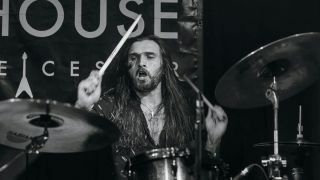 “Drumming has always been part of the family, starting with my uncle, he played quite a lot and even at the early age of two years old I used to sit behind his kit and just bang and make a noise! Who are your drumming heroes? 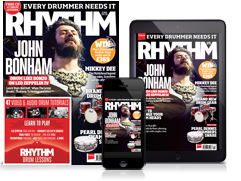 “There are so many people I could name but over the years I’ve always found myself talking about the same three drummers who I can easily class as true inspirations and my drumming heroes! "First, Mike Portnoy for his drumming skill, knowledge and charisma has always stood out amongst the rest for me! Secondly, the legend himself, John Henry Bonham - the man’s groove and feel was phenomenal and I think I speak for millions he has inspired many across the world! Which Bad Flowers song perfectly captures your sound and style? What’s the best drumming advice you have been given? How do you approach playing live with The Bad Flowers? “I always approach a live show with a fun professional attitude! I want to get behind my kit and do the best job I can I terms of keep a solid beat behind the guys, but having as much fun as possible! Do you work off the guitar or bass in creating parts and grooves? What have you got coming up that you’re most excited about? “We’ve been booked for a fair few festivals this year, the likes of, Steelhouse Festival; Stone Free Festival; Hard Rock Hell Festival; Teddy Rocks Festival and more that haven’t been announced yet.